Yesterday was Elvis’ birthday! 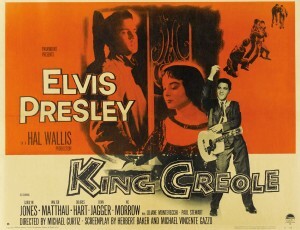 I watched KING CREOLE (1958) which I had never seen before! It is a super good movie! Yup! Elvis is Danny, a young kid who’s feeling still stuck. He’s working, wanting more, to be somebody. He’s not graduating high school another year, since those teachers think he’s a hooligan up to no good! Though Danny has the talent to sing he’s crossing paths with neighborhood toughie played by Vic Morrow and meanie club owner played by Walter Matthau. They really are a danger to his future! Then, there’s the love triangle. Who will he choose? The good wholesome girl (Delores Hart) he could marry and have a family with, or temptress of a woman (Carolyn Jones) who’s stuck with the wrong crowd too! KING CREOLE has got songs done in pure Elvis style and yes you see Elvis really had some acting chops. It’s worth the watch! You can find it on YouTube, thanks to Paramount Vault: WATCH KING CREOLE! Previous Previous post: The Movies I Saw In 2015! YUP!